National charity, Guide Dogs has publically thanked MP Julian Huppert for his support in its campaign to get the government to take tougher action over dangerous dogs after new measures were announced. The campaign was launched after an increase in the number of attacks on guide dogs across the country. 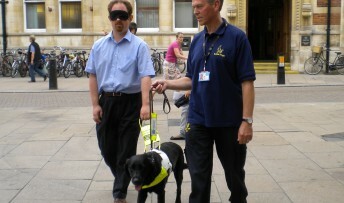 Research by the charity showed that the number of reported attacks on guide dogs rose from three a month to over eight a month between June 2010 and May 2012. On Wednesday (February 6) the government announced a package of measures to clampdown on dangerous dogs, including possible compulsory microchipping of all dogs from 2016. Julian gave his support to the charity’s campaign and publicised it by taking a blindfolded walk through Cambridge with a guide dog last year. Guide Dogs went on the social networking site Twitter yesterday to publically thank Julian for his support. “Thanks Julian Huppert for helping to protect guide dogs from dog attacks in campaigning for microchipping announced today,” it said. Julian said: “This was a very worthwhile campaign and I was delighted that I was able to help. “It is appalling to think that guide dogs are being attacked by dogs that are allowed to run wild by irresponsible owners.